Point Rotator Pro will save you hours of work. Autodesk® Civil 3D® Points inserted to the drawing have a default marker and label rotation aligned to the X-axis. If you use Point Labels for showing elevations aligned to Top of Curb or CL of Rail, or if you use Point Markers as Symbols for Catch Basins, Signs, Manholes, etc., and you have miles of features to label, Point Rotator Pro will save you hours if not days of work by aligning your points to the nearest LINE, ARC, POLYLINE, ALIGNMENT or FIGURE object. 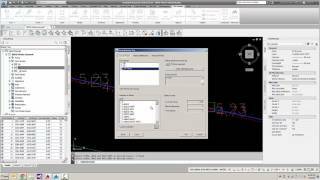 In addition to Civil 3D Points, it also supports rotating Autodesk® AutoCAD® TEXT and BLOCKS. Built out of necessity from real world survey projects spanning miles of road and rail, Point Rotator Pro is a must have in your Civil 3D toolbox.